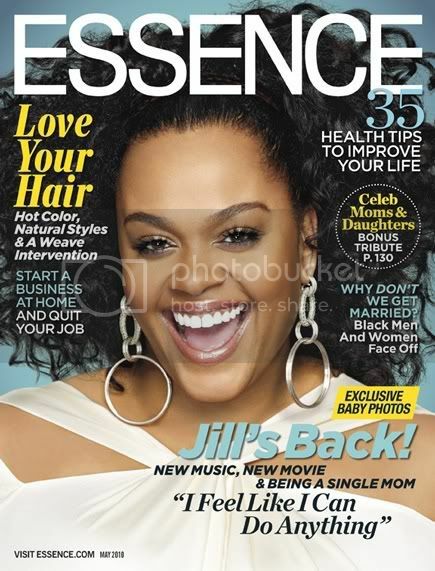 Jill Scott is covering Essence Magazine's May 2010 issue, and even though there are reports that she didn't like the cover photo, I think she's been looking fierce lately. With a string of lead movie roles under her belt and on the eve of a new album, the inimitable Jill Scott covers ESSENCE's May issue--looking and feeling better than ever! In "And Baby Makes 2," Jill is photographed at home with her 9-month-old son Jett, as she opens up about the difficult road that led her to single motherhood, her deep thoughts on interracial relationships, the sister circle that helps her get by, and the perfect life she enjoys today.